The mantra throughout the rounds of car launches and winter testing has been that nobody would really know where they stood until Melbourne, but that everybody would doubtless be playing catch-up to McLaren and Ferrari. This all-too-predictable phrase became all-too-predictable reality during the two practice sessions at Albert Park, with but a few choice morsels for the race goers to savor. One of the first treats Formula 1 had in store was the opening skirmish in the Bridgestone versus Michelin tire war. Everybody expected grip to be simply oozing from the two rival products, but despite the FIA's preemptive cuts in downforce over the winter it took Michael Schumacher a mere five laps to dip his Ferrari beneath Jacques Villeneuve's lap record from the slick era of 1997. Gripping stuff indeed. Following Schumacher's lightning start to the practice sessions, the Marlboro cars took up residence at the top of the timesheets. Yet for all Schumacher's promise it was Rubens Barrichello who first held sway. As the team bedded itself in for the weekend, Rubens started running on the softer Bridgestone compound and Michael the harder as they assessed the wear, degradation and outright speed each offered. Schumacher, though, was not to be outdone, and as the Friday running came to a close he was making a bid to go even faster when the yellow flags came out at Turn 6 for Nick Heidfeld's stranded Sauber. The approaching world champion jumped on the brakes and his Ferrari snapped right into a 270-degree spin. His rotations were stopped by the lip of the gravel trap which - hitting it squarely side-on - launched the F2001 into a triple barrel roll to great excitement everywhere except, it seemed, in the cockpit of car number 1. "I'm not altogether surprised about today's lap times, it was what I was expecting from a tire war" said Ross Brawn. "We have a faster car this year even with the new regulations." Behind the Ferraris - not very far behind, but significantly seldom in front - was the McLaren duo of Mika Hakkinen and David Coulthard. "We were pretty focused, as always, on just getting the car optimized for the race," said Ron Dennis, although Coulthard's nine lap stint was the team's longest on Friday. The initial signs were that the MP4/16 was starting the year significantly faster than everyone in the field apart from Ferrari and - over the course of a flying lap - perhaps a well-driven Jordan. The yellow cars emerged as early favorites in the race to be first behind Ferrari and McLaren, before Jarno Trulli hustled the EJ11 round Albert Park in the last minute of Friday's track time to go second behind Barrichello. The team remained realistic about its prospects for the weekend, but it was encouraging nonetheless. Behind the Jordans came Ralf Schumacher's Williams - which was the fastest Michelin runner by a mile as team-mate Juan Pablo Montoya raggedly got to grips with his first Grand Prix. Next up the BARs of Olivier Panis and Jacques Villeneuve traded times with one another and their Honda stablemates at Jordan but never appeared truly threatening. Special credit, though was earned by the young guns at Sauber, Nick Heidfeld and especially Kimi Raikkonen as the Finn kept pace with his more experienced team mate despite being on harder rubber. Jean Alesi struggled with driveshaft maladies for most of Friday, but late in the day stuffed the new Ferrari-engined Prost into the top ten to suggest that perhaps pre-season testing had not flattered to deceive. Fernando Alonso was also on impressive form for European Minardi, keeping pace with the Benettons and Jaguars throughout despite both car and driver having spent but 30 kilometers together on the road. Jaguar and Benetton, however, were in dire trouble. Eddie Irvine was clearly trying to wring the merest chink of light out of the horizon, but any appearance in the top half of the order was short lived while Luciano Burti looked increasingly flustered and put his R2 into the wall. The Benetton was expected to be slow and it delivered, unfortunately for Jenson Button and Giancarlo Fisichella. The Saturday practice sessions saw an apparent consolidation by Jordan as the team most likely to cause an upset with Frentzen fourth and Trulli fifth. Michael Schumacher meanwhile turned in a 1m 28.134 to set the fastest lap ever seen at Albert Park (over four tenths quicker than Jacques Villeneuve in practice for the 1997 race). Early in the second session Mika Hakkinen lowered the benchmark with a 1m 27.863, only for Schumacher to square up and set 1m 27.561 before a wheel bearing failed and he parked on the run-off at Turn 6. Because of this problem, the German refused to have the car pushed into a safe area and chose instead to wait for a crane. By happy coincidence (for Michael at least), this kept the waved yellow flags out at Turn 6 for much of the remaining practice time, allowing scant opportunity for others to try and better him. Undeterred, David Coulthard's McLaren flashed round to clip a couple of hundredths off Schumacher's time in the dying moments of the session to set the scene for a classic qualifying hour. The first highlight of qualifying was European Minardi's beleaguered Tarso Marques, and his rollercoaster bid to get below the predicted 107% barrier of 1m 33.5s for the first time all weekend. His lurid progress was two and a half seconds shy of that target, worryingly for team boss Paul Stoddart but hardly surprising given his lack of track time after a spectacular explosion of his European V10 on Friday. Jacques Villeneuve then opened the account for the front half of the field with an equally ragged lap that saw his underside take a particular beating at Turn 4. That likely cost him a second but, provisionally, he was on top and there he stayed in front of the impressive Kimi Raikkonen's Sauber and Juan Pablo Montoya's Williams. The Ferraris soon put an end to Jacques' moment of glory, but of the two it was Rubens Barrichello who stole a march - his 1m 28.178s putting over a second between himself and World Champion team mate Michael Schumacher. This in itself promised a lively afternoon, and obligingly Mika Hakkinen's McLaren rolled out of his garage to pick up the cudgels. The flying Finn's MP4/16 had yet to get the measure of the Ferraris at any stage in the weekend, but his 1m 28.098s lap was just the sort of improvement he was looking for. This, combined with Barrichello's speed, spurred Schumacher back out of his garage with almost indecent haste and in trademark, dust-kicking style took provisional pole back by over four tenths of a second. Being the first man into the 1m 27s clearly wasn't enough for the world champion however, and to some considerable surprise he stayed out. In practice he had tried a couple of five-lap runs, with a 'cooler' in the middle but it was not a choice for the faint at heart, but the result was as effective as it was agricultural: 1m 27.516s put him over half a second clear of the rest. Evidently this came as some surprise to the rest of the Bridgestone runners, and McLaren set about fitting in long runs for its two drivers. Meanwhile Jacques Villeneuve's best run was spoilt when he collided with Juan Pablo Montoya while trying to dive inside the slow-moving Williams, causing surface damage to both cars and a little tetchiness between the two former CART champions. Ferrari continued to surprise when Barrichello shaded Schumacher's pole time by 0.001s, but for his countryman Tarso Marques at the other end of the grid there was despair. He ran off the road on Turn 1 and got stuck, seemingly putting himself even further out of contention for the start on Sunday. It was another Brazilian who swiftly came to Marques's rescue in the form of Luciano Burti. The Jaguar number two was adding to the team's woes, having thrown away his first hot lap with an excursion into the gravel at Turn 1. His first competitive time of the day then logged, Burti went back out and started his second run. He got as far as Turn 5 on his hot lap where the left-rear suspension apparently gave way and the Jaguar scattered itself along a large stretch of the circuit after clouting the retaining wall. Worryingly for the FIA, the new double tethers intended to keep the wheels attached to the wreck in the event of a big accident summarily failed. Worryingly for Burti it was the lowest point of an inauspicious weekend, and with the proven Pedro de la Rosa waiting in the wings and Jaguar desperate to minimize its losses in 2001, he may not even get to start his home race next month if this form continues. The red flags were duly brought out, ruining seven other drivers' runs including both the McLarens and the leading Jaguar of Eddie Irvine - who had his barge board knocked off by debris - although for Marques and Minardi it was a godsend. Burti meanwhile hurried back to the pits, but was not allowed back out: "We didn't put Luciano in the spare because we didn't want to overburden him and we wanted to preserve it for tomorrow," said Bobby Rahal ominously. After a little more than ten minutes the track was clear and the pit lane reopened. Barrichello tripped over himself in front of Mika Hakkinen but Ralf Schumacher thrust his Williams up among the Bridgestone boys with a time of 1m28.218s to go fifth and maintain his position as the fastest of the Michelin men by some considerable distance. Jordan meanwhile was continuing a satisfying start to 2001. Until the start of qualifying it was Jarno Trulli who was not only the fastest Honda runner but also a dark horse for the front row, but Heinz-Harald Frentzen had not fully strung a lap together before qualifying and put in a lap which was fourth fastest. For Mika Hakkinen there was small encouragement in squeaking back onto the front row at the start of his long run, but after two slow laps he had no response to Rubens Barrichello on his final flier and it was a Ferrari lock-out. David Coulthard endured an anonymous session but he too stayed out longer, doing one cooling down lap and two hot ones in a desperate bid to claw back time. It failed, and his McLaren couldn't get beyond a fourth row slot. Almost unnoticed amid the last gasp brigade - in which Marques set his best time still shy of 107% - Michael Schumacher had climbed aboard the Ferrari T-car and headed out onto the circuit. With a little more than a minute to go and no hope of getting a final run in it was peculiar behavior, but nevertheless the German had sealed his first ever pole in Australia in dominant style. "I think the reason is that, first of all, Bridgestone has done a superb tire," said the polesitter of his qualifying success. "Secondly Ferrari has done again a good car. Even though we have these new rules they have compensated very well for that, even though they are a very big loss." Raceday dawned grey and insipid after the azure days of practice and qualifying, which seemed to act as a rallying call to the McLarens. Coulthard and Hakkinen were comfortably first and second at the end of the morning warm-up with Michael Schumacher languishing in seventh some six tenths back. All these things are somewhat academic of course, and with Jos Verstappen's Arrows in third place it was all the more so. Verstappen's team mate Enrique Bernoldi continued an inauspicious debut weekend by losing the car at the exit of the pit lane at the start of the session and crunching the nose in the wall, but overall it was a quiet morning. Not so the race. The carnival atmosphere born of an incessantly diverting line-up of support races and genuine excitement for the start of a new season reached a peak as the field lined up. Jaguar's Eddie Irvine had elected to swap to the spare car after a power steering failure, and more controversially Jenson Button's mechanics attracted the interest of the stewards as they worked on the spare Benetton until a couple of moments after the order to clear the grid, sparking an investigation. He would later be given a 10-second stop-go penalty. Also Tarso Marques was on the grid, against all expectation as he had not managed to set a time within 107% of pole in qualifying. An FIA bulletin, however, stated that he was allowed to take the start due to 'exceptional circumstances', giving rise to much muttered speculation as to what such phenomena might be. In truth - or at least Pursuant to Article 131 of the Sporting Regulations - it seemed that because Michael Schumacher's pole time was so exceptionally fast it didn't count (or something). While there was almost universal approval that Paul Stoddart would be able to wheel his new team out in front of his home crowd, the words 'dangerous' and 'precedent' also seemed apposite. At the sharp end however Michael Schumacher stormed off the line as the green flag ushered him onto the formation lap and he exuded a determination to do the same next time round. This he did most emphatically when the 2001 championship got underway for real, his Ferrari gaining almost half a car length on everyone else as the lights turned and the field was released while alongside him Barrichello's sister car bogged down and allowed the advancing horde to gain a lot of ground. David Coulthard sprang away from the inside of the third row and darted into the middle of the circuit in an attempt to rush the Jordan of Frentzen on his right and Ralf Schumacher's Williams on his left. The gap between Frentzen and Schumacher was dwindling however as the two Germans jockeyed for position going into the braking area for Turn 1. Coulthard, his front wheels between their two sidepods, got a clout from Frentzen that shoved him towards Schumacher and then a second, harder knock that forced him to back off. Amid locked wheels they all got through unscathed with Michael Schumacher imperiously leading Hakkinen, Frentzen, Ralf Schumacher, Barrichello, Trulli and Coulthard. Behind the lead group Juan Pablo Montoya fired the second Williams into his first standing start since the end of 1998 with great vigor, so much so in fact that he momentarily got amongst the leading pack before rocketing off the circuit when Turn 1 presented itself unexpectedly. He attempted to rejoin some way down the order and attempted to make up time. Going into turn three he made a lunge on Eddie Irvine knocking the Jaguar wide and into a half-spin. As Irvine dusted himself down and set about rescuing something from the race, the less fortunate Gaston Mazzacane whose Prost pulled off the circuit with flames emanating from its Acer-badged Ferrari engine, the Argentinian becoming the first retirement of the day. There were winners as well as losers however, as the determined Coulthard made a forceful move on Trulli that promoted the Scot to fifth. At the end of the first lap Michael Schumacher led Hakkinen by 1.2 seconds with Frentzen a further second behind. Ralf Schumacher crossed the line in fourth but had Barrichello swarming all over him and, going into Turn 1, the Williams overshot the braking area to allow the Ferrari, Coulthard's McLaren and Trulli's Jordan by. After the dust had settled Enrique Bernoldi set off on his second lap, but let the Arrows get away from him accelerating out of Turn 2 and pirouetted into the inside wall of the left-hander to end a miserable weekend. It gave the Brazilian a grandstand view of the leaders starting their third lap, with Schumacher still 1.2 seconds ahead of Hakkinen but with Frentzen fending off Barrichello's advances. They swung into Turn 1 together, and Barrichello lunged up the inside. It was optimistic, but sometimes optimism pays off and for Rubens this was just such a moment. Frentzen had some reason to feel aggrieved, sitting as he was in the gravel between Turns 1 and 2, but he had kept his wits about him and his engine running to set off in 16th place. Tarso Marques's unequal struggle with the Australian Grand Prix finally ground to a halt on the fourth lap, his old Ford/new European V10 letting go once again. Still his place on the grid was reward enough for the team, if not the driver, and hopefully he will be given the opportunity to show some potential before long. All this was of soon of little consequence, however, as the fifth lap brought about an incident of catastrophic proportions. On the long, fast run to Turn 3 Ralf Schumacher was about to start fending off Jacques Villeneuve's BAR, Ralf slightly to the inside as though to protect the ideal line and Villeneuve towards the middle of the circuit. Riding on board with Villeneuve the digital TV viewers saw the rear of the Williams swell hugely and rode through a gigantic impact. The BAR was launched upwards, pivoting over to the left and hitting the retaining wall almost backwards, debris flying past the camera and Villeneuve's exposed helmet until the signal from the camera was cut. The magnitude of the accident amid the high-walled confines Albert Park was only really evident from outside, however: Villeneuve's front wing disappearing skyward at untold speed, the car spinning nose high through the air to destroy itself against the wall and spectator fence as Schumacher's Williams spun to a halt. Initial concerns were for the drivers, but as the dust settled both Schumacher and Villeneuve emerged to great relief. That relief was short-lived, however, as the fact that bystanders had been caught up in the carnage became apparent and medical staff began attending to those hurt at the trackside. Word soon filtered back that a marshal was involved and, later, that spectators had been hurt. The medical crews lingered at the scene for an uncomfortably long time, and when the ambulance finally pulled away it was with a solemn lack of urgency. There would be no announcement until the end of the race, but the indications were clear and troubling. In the pit lane the media workers discreetly began to work through the carefully structured crisis communications schedules that everybody in professional motor racing keeps and hopes never to use. It was initially reported by eyewitnesses that a wheel had entered the marshal's enclosure through a gap in the debris fence provided for photographers, hitting the marshal in the chest, while eleven spectators suffered cuts and bruises from debris. Whatever the case may eventually prove to be, a second Grand Prix safety worker lay at the trackside undergoing cardiac massage in the space of six months. Meanwhile as soon after the ambulance rolled gently into the pit lane and out of sight as the field came round to finish its 14th lap, Jos Verstappen's Arrows dived into the pits to take advantage of the Safety Car situation. Life went on, perhaps a little crassly. Motor racing can be like that. The show must go on, and with no official announcement it was clear that Arrows was on a two stop fuel strategy for all that mattered. At the end of the 15th lap the Safety Car pulled off, the green flags waved and Michael Schumacher set about building himself a lead, immediately reinstating the single second between himself and Mika Hakkinen. Far behind them Heinz-Harald Frentzen made a forceful move up the inside of Jean Alesi to trail Kimi Raikkonen who was putting in a deeply impressive debut with Sauber. Raikkonen in turn slid purposefully inside last year's new boy Jenson Button whose underpowered Benetton had no answer to the challenge for his tenth place. The next lap Button was called in for a stop-go penalty for the team's infringement on the grid. In an ignominious debut for the Benetton B201 and the 111-degree Renault V10 it was purely mathematical and soon the young Brit's pace began to fall away still further. "After my penalty there was a problem, which we think was the exhaust," said Button. "It's a shame as that meant I ultimately had to retire so close to the end of the race." Up front Schumacher was piling on the pressure, breaking under the 1m 29s barrier on lap 20 and staying there, building up a five-second advantage over Hakkinen by lap 25 before the two top men of the modern era found their opening exchanges curtailed. Hakkinen was chasing hard, also in the 1m 29s bracket, when his left front suspension gave way at the end of the back straight, and the Finn suffered a very sizeable impact with the tire wall, prompting a quick trip to the medical center. "Something broke on the car," said Hakkinen. "I hit the brakes and then lost control of the car. I went to the medical center for a check-up as something hit my helmet but I'm fine." The incident put Schumacher in a commanding 10-second lead over his team mate Barrichello, although the Brazilian had to contend with the sight of David Coulthard's McLaren looming large in his mirrors. Nevertheless they held station until lap 32, when Schumacher launched himself into the 1m 28s. The next time round Barrichello came through Turn 1 unprepared for the Minardi of Fernando Alonso that he found there and had a slight wobble. Alonso had, like Raikkonen, been a revelation all through the weekend and was seemingly blameless for Barrichello's moment but perhaps Rubens might disagree. It unbalanced the Ferrari enough for Coulthard to make a run into Turn 3 which he did - novelly - by going round the outside of the Ferrari on the right-hander, holding his ground and winning through into the left-hand Turn 4. It was a bold, assertive move of the kind DC is capable only on best form, but which bodes well for a decent season for the Scot. By this stage Schumacher was 15 seconds further down the road, where he stayed, setting a new lap record of 1m 28.214s on lap 34, until he swept into the pits at the end of lap 37. Coulthard drove aggressively to try to cut down some of the advantage. Schumacher was underway in 10.7 seconds and rejoined behind Barrichello, some 15 seconds behind Coulthard. Barrichello was in at the end of lap 39 for his stop. Traffic, a full fuel load and the cold tires on Schumacher's Ferrari saw Coulthard's lead open to 18.1 seconds before he came in for his stop at the end of lap 41. He had done enough to keep ahead of Barrichello, but Schumacher had assumed an all-but unassailable lead that was easily maintained to the flag. With the Ferraris and the McLarens over the line in the short order, there was a wait of over a minute for the first 'division two' runner who, on the track, was Olivier Panis for BAR who had benefited from Jarno Trulli's retirement on lap 33 due to a misfire. It was not to be such a warm return to competition for Panis as he hoped, however. Sauber lodged a protest against him for allegedly overtaking Nick Heidfeld under yellow flags, which was upheld by the stewards. This promoted Heidfeld to best of the rest status and brought Kimi Raikkonen into the points in his debut event. Between them was Frentzen's Jordan in fifth, small reward perhaps in the light of the new car's potential but invaluable points scored nonetheless. Outside the points, and lapped, Luciano Burti led home Alesi, Verstappen, Irvine, Alonso and Fisichella as the walking wounded from the first of what is set to be a season of intense midfield battling for those all-important points. The top three drivers stood solemnly on the podium, having been informed of the death of a man who had volunteered to try to ensure their safety. 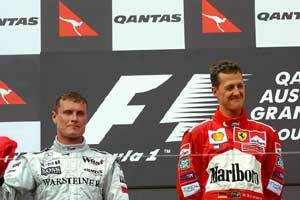 Michael Schumacher had won his second successive Australian Grand Prix and his fifth consecutive race since Monza the previous September. "It's hard work we've done over the winter to be back here where we are," said Schumacher. "Unfortunately we've just been told that the marshal did die, and obviously we are all shocked about this and we have to look at what is possible from our side, what support we can give,"